Watershare members NTUA and KWR are participating in the EU Horizon2020-funded SUBSOL project (bringing Subsurface Water Solutions to market). SUBSOL is a three-year project that started in 2015. The consortium partners marked the first 18 months of SUBSOL during their Project Steering Board meeting in Copenhagen on 6 and 7 April. During the first day of the meeting, which was organised by the Geological Survey of Denmark and Greenland (GEUS), the consortium partners together with members of the Project Advisory Committee (Enrique Fernández Escalante and Andrew Hughes) discussed the results of the first half of the project on Subsurface Water Solutions (SWS), as well as the challenges for the next and final 18 months of the project. In summary, we concluded that the successful implementation of full-scale SWS references in SUBSOL, and the ongoing demonstration of SWS at the four replication sites in Denmark, Greece, the Netherlands and Mexico, fully support the market uptake of SWS, as robust measures to secure freshwater supply and to enable water reuse in water-scarce areas worldwide. Besides technically facilitating water reuse, there is a growing awareness that the subsurface may also play a key role in the public acceptance of water reuse. Within SUBSOL a flexible web-based SWS knowledge environment is being developed to support future users in applying SWS. The knowledge environment includes a knowledge database, a marketplace and a toolkit with operational tools, such as an online data monitoring dashboard to optimise SWS application and a location identification tool for SWS wells. Several elements of the knowledge environment have already been completed and will be tested by the SUBSOL partners over the next months. The SWS knowledge environment will be linked to initiatives and web-based platforms to secure application after the project lifetime. The successful implementation of SWS strongly depends on the awareness among regional stakeholders. A number of participatory Technology Assessments have been carried out within SUBSOL to increase awareness at the replication sites. Based on initial market analyses in selected regions worldwide, missions were sent to target regions and confirmed the promising prospects for the successful market uptake of SWS. The second day of the meeting included a visit to the SUBSOL replication site on Falster Island. 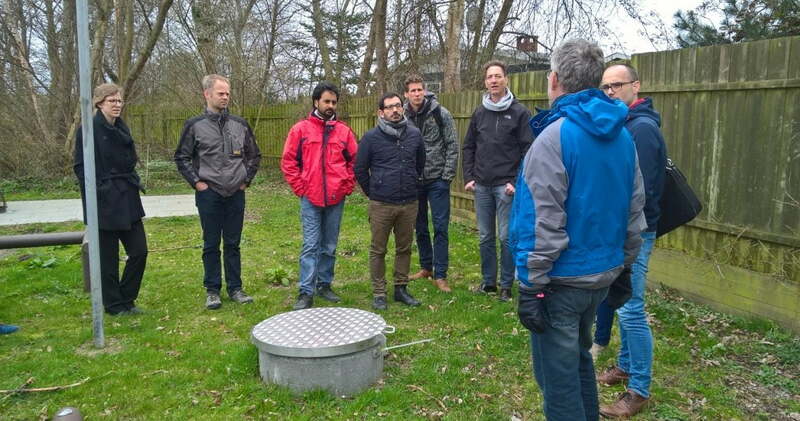 The visitors were shown the coastline and the experimental activities of GEUS, which aim at optimizing the SWS set-up to secure the availability of freshwater for the populated coastal recreation area. Specifically, tracer experiments to identify water flows in the complex, fractured chalk aquifer were explained and discussed. Explanation of field experiments by Klaus Hinsby.